Collegiate yearbooks became came a thing of the past during the 1990s. New forms of media, rising costs, and dwindling sales led many colleges and universities to cease publication. The University of South Carolina Lancaster published their last yearbook in 1992. In 1994 the University of South Carolina ended nearly 100 years of tradition as the Garnet and Black went to a magazine format. 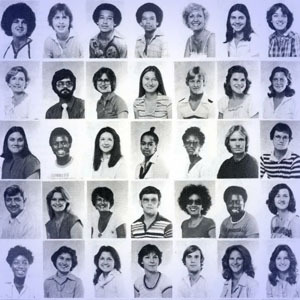 USCL yearbooks cover 22 years of campus history, from 1963-1983 and 1992. There were several different formats and name changes during this period. Garnet and Black, the official yearbook of the University of South Carolina began publishing annuals for satellite campuses in 1963. Originally called “Centers”; “Regional Campus” later became the name of choice. Longtime Lancaster residents however for many years referred to USCL simply as the “extension”. Early editions compiled information from all campuses together making it difficult to create a digital collection devoted solely to Lancaster. Later editions devoted small sections to each campus yet continued to group all class photographs together. USCL began to publish their own yearbook in 1970 and continued this tradition for several years. Of special note was the 1975 spiral-bound annual which had students and faculty grouped together by zodiac signs. Synthesis originally began as a merger of the school’s literary magazine and newspaper in 1977. In 1978 the decision was made to merge Synthesis with the yearbook and switch the format to that of a magazine.